It’s that time of the year again and I couldn’t be more excited! The Chinook are running in full force now that the temperatures have fallen on the north shore of Lake Ontario. With a little bit of help from this past week’s rainfall and cool north winds the fish are coming up rivers from Niagara Falls to Kingston, and on rivers throughout Georgian Bay and Lake Huron. This is textbook salmon weather at it’s finest. I can remember last year’s salmon season on the north shore of Lake Ontario and in the north like it was yesterday. I am sitting here today doing the same thing I did at this time last year; tying into these kings using globs of Fire Cured skeins. Although the current run is considered late by most anglers I don’t think we are that far off. I’d call it normal since Chinook usually spawn mid to late October. On a positive note the numbers of fish I’ve seen over the last several weeks have shown me signs of a strong run coming. Lack of rain and warm water this past month seems to be pushing some of the fish towards darker spawning colors. Meanwhile, there are still fresh silvery Chinooks to be had, not to mention coho’s, brown trout and early run steelhead. We’ll be curing, curing & curing! 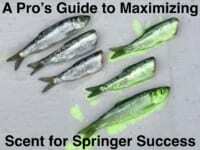 Most anglers who target salmon using skein chunks or big roe bags know how quickly you can burn through eggs. By curing your eggs, you not only give the eggs more shelf life in the fridge (about a month’s time), but also more life where it matters most, and that’s in the strike zone! My personal favourite is sprinkling Red or Pink Fire Cure on my eggs with a little bit of BorX O’ Fire mixed in. Even in the clearest of water conditions bright red and pink eggs are irresistible for the kings. Almost all of my Chinook this season have been taken on Fire cured skein chunks fished under a float. On the other hand, I have caught fish on wet and dry cures. Oftentimes I like to dry eggs prior to fishing them. This hardens them a little and makes them tackier, which help your skein chunk last longer on your hook as the membrane toughens up. In fact, small treble hooks, according to the size of the skein chunk you are fishing, help your skein chunks stay on the hook much longer. Besides using skein chunks for Chinooks, giant ‘choker’ sized roe bags tied in bright colors like pink and chartreuse produce fish under a float as well. Bags require more work, but can be effective. I have confidence in scraped salmon eggs (eggs separated from the membrane) when salmon. 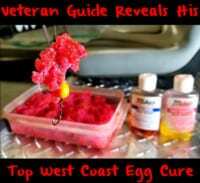 After I am done fishing for salmon using skein chunks, I scrape my eggs and cure them using Orange Fire Cure to prepare my bait for the steelhead fishing that lies ahead for the next seven months. GTA salmon fishing has been good the past few weeks and will remain steady. The egg bite should be on for another few weeks before the salmon head into spawning mode. I’m anxious to see more steelhead showing up, too. Play it safe out there and remember to be courteous on the water. There’s a lot of anglers out there!